While Iain Robertson took an instant dislike to the all-new Citroen Cactus at its Paris ‘reveal’ earlier this year, driving the first example on UK roads has provided him with a different and significantly more positive perspective. Driving cars is my life. Fortunately, I love driving cars. However, it is consummately easy to be drawn into an immensely cynical view of many of the latest models. There is a valid reason for it and it lies squarely at the doors of the same marketing people, who create fallacious reasons for people to buy their companies’ products, which is followed up by the efforts of the PR personnel to get the media to promote their wares. Believe the hype and you might try the product. Question it and cynicism builds. Yet, eight months after making me livid, I can tell you that I have not enjoyed driving a new car as much as I have done the Citroen C4 Cactus. A ‘volte face’ does not assume greater significance. Its exterior is intriguing, made more so by the adoption of the ‘air-bumps’ on its flanks and bumpers. This not a ‘delete option’ and, regardless of the Marmite feelings they might generate, they do garner attention. The interior surfaces range from jarringly cheap to engagingly pleasant. Yet, there is an all-pervading air of quality about the car that outweighs any potential negatives, not least the car‘s price range. In fact, it is solidly constructed and feels particularly secure on-road, which engenders only positive critique for the quality of the car’s ride and the fact that its suspension actually works in a Gallic style, which is a first for Citroen, since it sold its soul to Germania (thanks, C5 marketeers). However, I should like to tackle the pricing issue, as the new Cactus Crosshatch does start at a £12,990, which is conspicuously good value for money. However, the example tested, in Flair specification, is tagged at £5,000 more and the options fitted factor in £2,435 additional cost, as follows: metallic paint (£495), stone grey AirBumps (£150), red door mirror housings (£50), thermally insulated panoramic sunroof (£395), space-saver spare wheel (£75), city park pack (£325), eTouch emergency and assistance system (£250) and the black leather and cloth trim pack (£695). It is not looking such good value now, is it? Fortunately running costs should not become too much of a burden, as the 100bhp Blue version of the 1.6-litre HDi diesel engine emits a mere 89g/km of CO2 into the atmosphere, which equates to a zero charge VED and just 14% Benefit-in-Kind charges for business users. Naturally, the customary Official Combined fuel economy guide figure looks phenomenal but becomes a bit questionable at 83.1mpg, although trying really hard on the recent MPG Marathon another example of this car attained a superb 95mpg in the hands of professional economisers. Sadly, I could not replicate those figures and my lowest was around 45mpg, while the best figure returned was around 55mpg, still respectable, if some way short of the claim. The fairly low stated power output of the diesel unit still manages to deliver an excellent 187lbs ft of torque, or pulling power, which ensures that, when it is combined with the relatively low 1,225kg kerb-weight, its performance is excellent. The 0-60mph benchmark is given as 10.4 seconds, with a top speed of 114mph. However, this disguises the actual impression of verve, as the Cactus feels a lot quicker than the suggested figures. The 5-speed manual transmission is well-geared, although the shift mechanism was slightly ponderous, demanding far greater movement around the gate than I have become accustomed to with any PSA Group product of the past three decades. Still, relying on the strong torque, frequent gearshifts become less necessary (there is a pushbutton actuated, automated-manual transmission as an option). As mentioned earlier, the ride and handling compromise of the Cactus is significantly less than it is for many models available at the price. Damping control is firm but compliant, while body roll is kept in check and the grip from the 50-profile tyres (fitted to 17-inch diameter alloys) is excellent. The steering is lovely to wield, being both fairly direct in its responses to input, while also guiding the car impeccably over almost any road surface. Bump-thump is kept at low levels and there exists a feeling of tremendous resilience to the car’s underpinnings, surely helped immeasurably by the structural rigidity (and the car‘s ride height). In terms of space, the Cactus copes well with accommodating up to five people, although the adjustment range of the driver’s seat was a little strange, causing me to position my bottom quite low, while my lower limbs were bent ‘daddy-longlegs style’ around the hide-wrapped steering wheel and my arms outstretched to reach it. It was not uncomfortable, just a bit odd, although I did have plenty of head and shoulder room. The solitary drinks-holder was a slight annoyance. The twin electronic-screen displays work easily enough and are pleasing to the eye, although the typical PSA Group sat-nav system demands too much non-intuitive learning to enhance its value. The lack of a rev-counter is a case of corner-cutting too far. 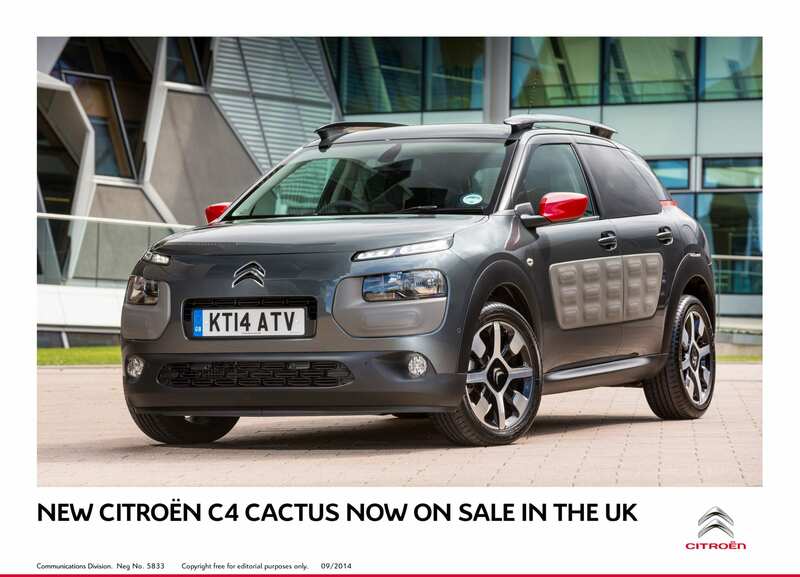 Even Citroen knows that the Cactus Crosshatch is going to gel opinions into love it, or loathe it categories. I can tell you that I fall into the former classification, even though I tried very hard to dislike the car. My initial animosity arose from the fact that Citroen wanted to be perceived as having ‘returned to its creative roots’. The problem remained that the Cactus platform is merely that of a stretched C2, with C3 parts added, renaming it as a C4 model. Compounding the issue is the fact that Cactus is a solitary blip on Citroen’s landscape. Apart from the fact that it contains no genuine innovations, in either the use of novel recyclable materials, or even its manufacturing processes, the British motoring media has been weighing-in with immense and award-giving praise for its reputed innovations…of which there aren’t any! What’s more, after the Cactus does its production run, there is unlikely to be another. The simple truth is that the car was created from a minimal budget, at a time of maximum need, when Citroen was going through some issues, and it needed to create some positive impact. Well, it has achieved that aim but to dress it up as something remarkable is no less than pulling the wool. As a car, Cactus works. It is attractive and attention generating. As a marketing model, it has some crosses to bear but it works. If Citroen had introduced this car ten years ago, it might have created somewhat greater stir, with a longer term, slower burn reaction. However, the best I can say for it is that the C4 Cactus is serving a momentary purpose, which is as fleeting as a copy of the Daily Mail, only of more merchantable quality. Conclusion: Bottom line is that I like the C4 Cactus, quite a lot, actually. It drives well, is moderately comfortable (for a two-metre tall driver) and does not break the bank in running cost terms. Be careful, as usual, with what you specify on the car, as the costs can escalate speedily. Otherwise, enjoy. Motoring ‘what’s up?’ and a chance to rant!